The record books list the following Tennis Grand Slam Trivia for all and the subsequent generations of tennis fans to read and admire. That said, the following pages will arouse your curiosity. Read them here. Legends had come and gone in tennis but their exploits are not forgotten.Steffi Graf, Pete Sampras, Andre Agassi, Bjorn Borg, Michael Chang, Rod Laver , Martina Navratilova, Don Budge,- their names will always be in the annals of tennis history , never to be forgotten. They will be remembered for the most wins that they registered in certain tournaments although their records might be eclipsed in the future by up and coming stars like Serena Williams , Andy Roddick , Roger Federer, Venus Williams. Legions of tennis fans all over the world had witnessed great games played by their tennis stars at the US Open, the Wimbledon, the French Open, and the Australian Open, all Grand Slam tournaments, the top tennis tournaments in the world. The games were televised via satellite in their living rooms. Thanks to technology, anybody around the world can be a spectator of tennis games. Feats of strength, excellence, endurance, and the will to win are listed in the record books for all to see. Do tennis Grand Slam trivia interest you? 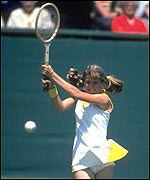 Does anybody know who the oldest US Open singles champion was? Perhaps you don't know. Answer. Bill Larned - his name probably doesn't ring a bell - that's because he accomplished the feat in 1911 and maybe nobody who watched that championship match that he won in 1911 is still alive today. Come take a look at the tennis grand slam trivia inside these pages. 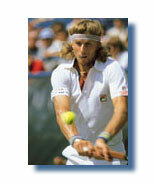 In 1980, Bjorn Borg became the first player to win 5 consecutive Wimbledon singles titles since Willie Renshaw in 1885. It took 27 years before Roger Federer tied the record. In 2007, Roger Federer won his fifth consecutive Wimbledon singles title.